Liverpool vs Manchester City – Wednesday, April 4, 19:45BST/20:45CEST – Anfield, Liverpool, England. Liverpool vs Manchester City sees two of England’s top three clubs face off in a European quarter-final for the first time. With both teams preferring a style of play that has – at times – blown their Champions League opponents away this particular fixture could become a UEFA classic. 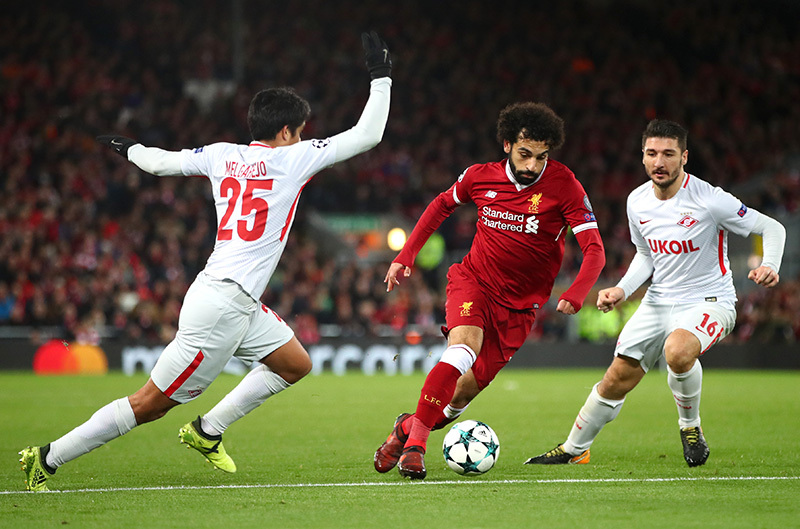 To preview this all-English affair the Futbolgrad Network spoke to Associate Editor, Chris Williams for his take on Liverpool, whilst Mark Temnycky – a regular contributor to the network – gave his thoughts on Manchester City’s chances. Liverpool welcome Manchester City to Anfield for the second time this season, the neutral will be hoping for a repeat of January’s encounter. The Reds inflicting a first – and so far only – defeat of the Premier League season on Pep Guardiola’s City side with a 4-3 victory in an epic encounter. Alex Oxlade-Chamberlain gave the Reds an early lead and, though Sané levelled shortly before half-time, three goals in ten second-half minutes from Roberto Firmino, Mané and Mohamed Salah put Liverpool 4-1 up before the vistors pulled the scoreline back to within one. Whilst January’s game made for a riveting spectacle, any sort of similar result will leave Liverpool’s Champions League future hanging in the balance. Should Klopp’s men wish to advance they will have to be resolute at the back – something that hasn’t come easy this season domestically, but in Europe the story is very different. The Reds are unbeaten at home in this season’s UEFA Champions League, picking up seven points at Anfield in the group stage. They drew 2:2 with Sevilla before dispatching NK Maribor 3:0 – finally wrapping up first place in Group E with a 7:0 dismantling of Spartak Moskva. In the round of 16, a five-nil success at FC Porto preceded a goalless second leg on Merseyside. Meanwhile, Manchester City have a different story. After returning from a relaxing week in Abu Dhabi, they continued their dominant form by dispatching Everton with ease at Goodison Park. Returning to Merseyside on Wednesday night, the Sky Blues should face a sterner test. Throughout Guardiola’s second season City have been remarkable – scoring 124 goals in 48 matches across four competitions, crucially though the Sky Blues have only conceded 34 times. With the Carabao Cup secured and the Premier League all but won, the Catalan coach and his men can now focus all their resources on the Champions League. They will have some cause for concern, however; the Manchester Derby falls in between this two-legged affair, which could prove an unwelcome distraction to this two-legged tie. Having defeated Everton, Manchester City only need three points from seven matches to capture the Premier League title. Should Manchester City defeat neighbours Manchester United at the Etihad this Saturday they will be crowned Premier League champions. Whilst a tantalising prospect, City must be careful not to lose focus against Liverpool. City folk-law may wish to look back at a title-winning victory against their ‘noisy-neighbours’ but Guardiola was brought in to win the Champions League – something the Abu Dhabi based board will be keen to see brought to fruition. AS Roma will be wondering how they let the 25-year-old leave for £37 million. Not only was Salah the first player in England this season to reach 30 goals (he reached this in February) the left-footed assassin has now notched 37 in total. Breaking Robbie Fowler’s Liverpool record on Saturday for the most ‘Premier League goals in a season’ – on the last day of March. The Egypt international needs two more goals to equal the record for ‘goals in a 38-game Premier League season’. Three players have managed this with 31 goals – Luis Suarez in 2013/14, Cristiano Ronaldo in 2007/08 and Alan Shearer 1995/96), very few would bet against Salah to break this record also. Since his 2011 arrival in Manchester, the Argentine has averaged 28 goals a season. Having scored 30 goals in all competitions during this campaign, it does not come as a surprise that he is Manchester City’s all-time highest goal-scorer. Having recently returned from injury, the 29-year-old should be in full contention for the trip to Liverpool. 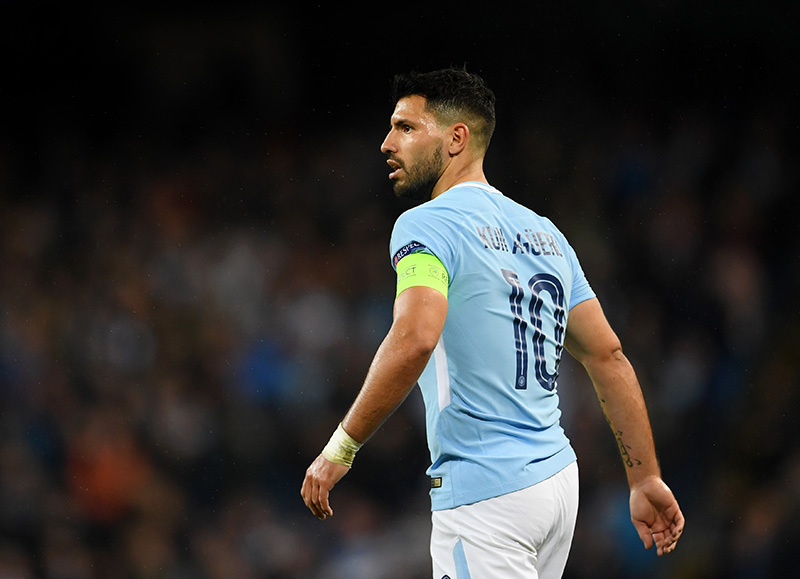 Anfield is a stadium Agüero has never scored at – should City wish to progress to the semi-final stage of this competition then he may need to overcome this barrier. If he does, then the Independiente youth graduate will record his 200th goal for the Manchester side in just 291 games. Whilst this is a first Liverpool-City game in Europe, the teams have met on 178 occasions in English football. Liverpool have won 87 of those contests to City’s 45, with 46 draws. In this season’s Premier League, City were 5-0 winners in Manchester whilst Liverpool turned the tables on City winning 4-3 victory in an epic encounter on Merseyside. 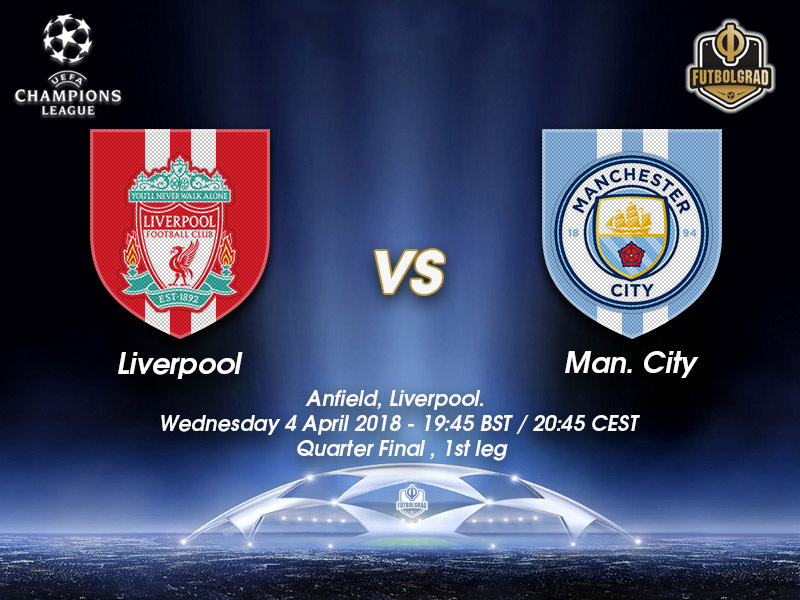 This is the 17th time English clubs have been paired together in UEFA competition, and while City have been involved in just one of those previous ties, this is the tenth domestic affair for Liverpool in the European arena, including five of the nine UEFA Champions League knockout contests. 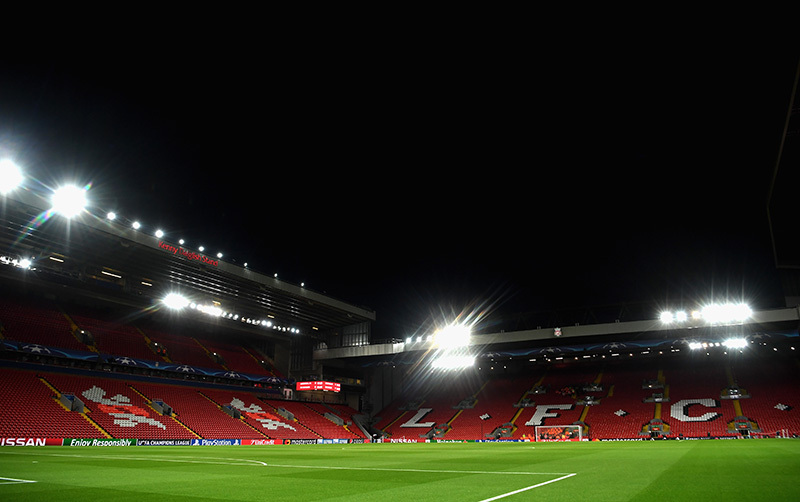 The Futbolgrad Network will be LIVE in Liverpool for Wednesday’s clash as two of this season’s big Champions League hitters face off under the lights at Anfield.